By end September every year, in Sparta Groves we start a very selective harvest. This is our FIRST GREEN GOLD harvest. In selected groves of Athinoelia cultivar, which is the oldest Greek cultivar, considering to be the flagship of the Greek olive trees, our teams of people start hand picking the valuable green olives. When we say hand picking, we mean hand picking, but not only. Tables are set in the groves and as soon as the olives are in the baskets, are emptied for a second hand selection process. Pressed, stepped, damaged, foot stepped olives and leaves are taken out. That’s a ten percentage of our harvest, before placed again in the baskets and then taken to the mill the very same evening. In our mill, we use fresh clean water to wash the olives and new washed drums, before we start the cold press process. A long, costly process, on which we accept no compromise and we are proud of it. 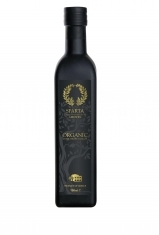 Our precious extra premium extra virgin olive oil is not stored in tanks for weeks or months. The day after is pressed we are bottling it as this is the way fresh olive oils should be treated.We bottle our precious olive oil in a basic common bottle, the square, so called Marasca bottle. Then as soon as bottling is done, we hand wrap the bottles in recycle paper. 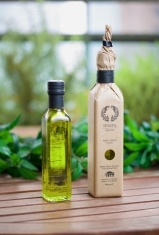 For underline the limited and uniqueness of our olive oil, all bottles are individually numbered. 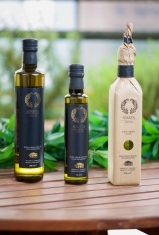 Therefore our First Green Gold, same as all our extra virgin olive oils, are stored in our warehouse in a controlled temperature at 15C. This is not something new; we just follow the same practice as our forefathers did for ages. They were storing their olive oil in their dark breezy cellars, in to preserve it during of the Mediterranean heat. 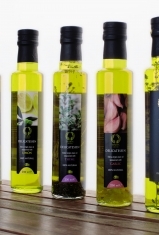 The daily consumption of 20g of the analyzed olive oil sample provides 22mg of hydrotyrosol, tyrosol or their derivatives (>5mg) and consequently the oil belongs to the category of oils that protects. It should be noted that oleocanthal and oleacein present important biological activity with properties similar to those of ibuprofen ( Motrin, Nurofen, Advil, Nuprin) and they have been related with anti-inflammatory, antioxidant, cardioprotective and neuroprotective activity. The levels of oleocanthal and oleacein are higher than average values of the samples included in the international study performed at the University of California, Davis and Prokopis Magiatis, Associate Professor, Athens University Faculty of Pharmacy. 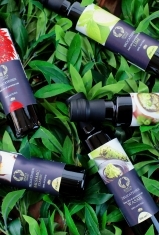 All in a natural product, without any side effects. Even today the older people in Greece, especially those from olive production regions, they start their day with a soupspoon of raw olive oil, same as our forefathers have been doing for millenniums.